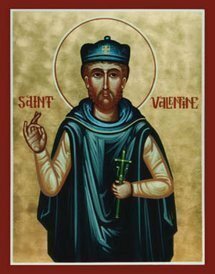 St. Valentine was martyred on February 14. However, Valentine or Valentinus is the name of at least three martyred saints. The most celebrated are the two martyrs whose festivals fall on February 14, the one, a Roman priest, the other, bishop of Terni. It would appear from legend that both lived during the reign of Emperor Claudius II (Gothicus) around 270; that both died on the same day; and that both were buried on the Via Flaminia but at different distances from the city of Rome. A third Valentine was a martyr in the Roman province of North Africa about whom little is known. Claudius the Cruel had banned his soldiers from getting married, believing that unmarried members were more reliable on foreign military campaigns. Valentine was beaten and beheaded because he secretly married soldiers to their wives contrary to the ban. It seems that the first celebration of the Feast of St. Valentine was declared to be on February 14 by Pope Gelasius I in 496. Valentine is the patron saint of beekeeping, epilepsy, as well as the plague, fainting, and traveling. And of course, he’s also the patron saint of engaged couples and happy marriages. Many authorities believe that the lovers’ festival associated with St. Valentine’s day comes from the belief that this is the day in spring when birds begin their mating. But there is another view. In the days of early Rome, a great festival was held every February called Lupercalia, held in honor of a god named Lupercus. During the founding days of Rome, the city was surrounded by an immense wilderness in which were great hordes of wolves. The Romans thought they must have a god to watch over and protect the shepherds with their flocks, so they called this god Lupercus, from the Latin word, lupus, a wolf. One of the amusements on this festival day was the placing of young women’s names in a box to be drawn out by the young men. Each young man accepted the girl whose name he drew, as his lady love. It remains unknown whether the customs of Lupercalia are perpetuated in Valentine’s Day. 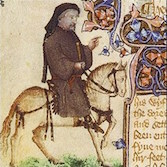 …his was the first mention in published literature of the holiday as we know it today! …and the one who succeeded in saying this first expected a present from the one to whom it was said, making things pretty lively on St. Valentine’s Day. Paper valentines date back to the 15th century, and cards to the 18th, but it took the enterprise of America to make a buck at it. Esther A. Howland, who produced one of the first American commercial Valentines in 1848 sold $5,000 worth — when $5,000 was a LOT of money — in the first year of sales. If you’re asked if you have a date for St. Valentine’s Day, you can say Yes… my date is February 14.